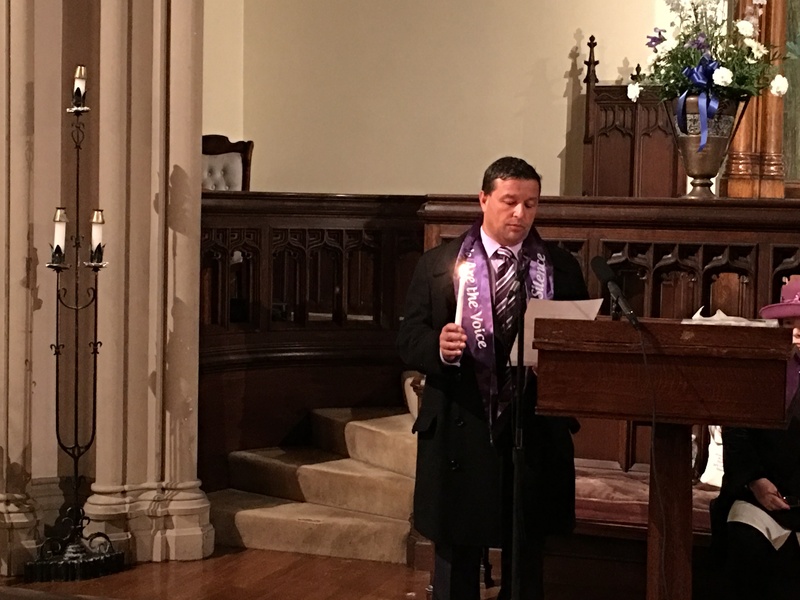 New Bedford Police Chief Joseph Cordeiro was among the community members who lit candles and participated in a vigil in memory of domestic violence victims across the state. The vigil, which was held Oct. 25, was the latest in a series of observances in October to commemorate Domestic Violence Awareness month. The candlelight procession began at City Hall and ended at First Unitarian Church, where a ceremony was held to honor the victims. During the ceremony, area residents read the names and stories of 17 domestic violence victims who were killed between Nov. 8, 2015 and Oct. 6, 2016. The annual vigil honors the memory of those lost to domestic violence and honors the survivors and the families of all those touched by domestic violence. The ceremony was hosted by The Women’s Center, which is located at 405 County St. The center offers a 24-hour hotline that provides support and resources related to domestic violence. The hotline number is 508-999-6636.